New: Selections from Harvey Phillips famed OctubaFest performances are now available in arrangements by Norlan Bewley for Tuba/Euphonium Quartets or Ensembles. Ever notice that your low brass never get any better playing only band music? Wish you could start low brass from the beginning instead of switching them over later? Tired of losing the low brass you have because they're not challenged enough? Try Norlan Bewley's Performance Through Participation approach! 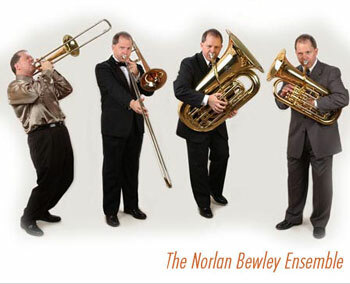 Norlan Bewley, Low Brass Artist (trombone, euphonium, and tuba family of instruments), is a new breed of brass player specializing in performance on all of the low brass instruments. For the past twenty years he has had extensive experience teaching, performing on, and composing for low brass, developing an unparalled perspective, insight, and approach toward these instruments.Through years of private teaching and performance, he has developed direct and effective methods of instruction that address the most basic and difficult areas of low brass playing in a manner clear to all, from beginners to professionals. In his private teaching alone, for the past 10 years Norlan has given more than 700 individual low brass students over 23,000 private lessons. A champion of the instruments, he is dedicated to the improvement, advancement, and increase of opportunities for every aspect of low brass education and performance. The online music store is a recent addition to the website, offering Mp3s, sheet music and compositions for the trombone, tuba, and euphonium in the low brass ensemble format. While designed for the Low Brass Ensemble (trombone 1 and 2, euphonium, and tuba), the pieces are also fun as a play-along for the trombone, euphonium, or tuba or to start your own Low Brass Ensemble. We have developed a new series of Video Lessons for euphonium, baritone, tuba and trombone players. We'd like to hear from you on what you think so we are offering these lessons for your evaluation and comments. I'd appreciate your feedback. Dissatisfied with typical "sit and listen" style clinics, Norlan has developed the Performance Through Participation approach for clinics and residencies. Participants bring their instruments, becoming a Low Brass Ensemble for the clinic. Norlan rehearses the ensemble on 4-part music he has written for these clinics, demonstrating technique and fundamentals in a manner that allows participants to apply them immediately. Everyone learns everything first hand while in a playing situation, increasing understanding and retention; plus they play great music that they get to keep! - La Bamba - performed by Norlan on all four parts of the Low Brass Ensemble.